SIMPLE DESIGN for BEGINNER: The easy-operated controller has Mode 1 and Mode 2, one key to switch, which allows everyone to play this drone, no matter you are in Mode 1 / Mode 2. HEADLESS MODE: Headless mode enables the drone automatically locking into the take-off direction when it flies to a height where the operator can't judge the direction of the drone head through bare eyes. With 4CH 6axis gyro, it performs well with powerful signal and without interference. 3D ROTATION & ONE KEY RETURN: It can go up, down, 360-degree roll for perfect action and wonderful performance. With the one key return function, you can call back the aircraft after GPS positioning by signals emitted by remote control. 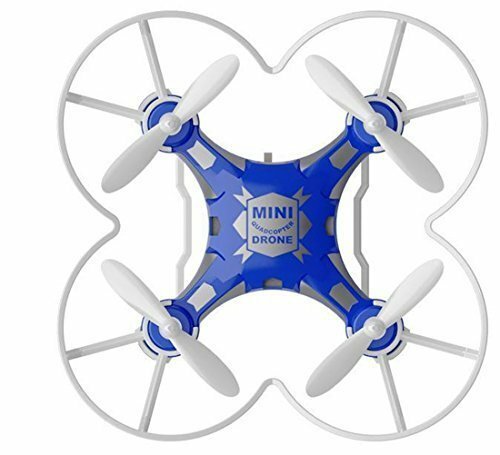 MINI POCKET DRONE: Its mini size not only allows for indoors or limited space flight, but also convenient for carrying on to outdoors. Perfect toy for increasing the intimate relationship with the kids. DURABLE PROTECTION: Rotor protector is included for the rotors and motors, also avoid anyone to get injured. The controller includes a charging cable allows you to charge the drone batteries in the controller, also USB cable is available. If you have any questions about this product by M MAKETHEONE, contact us by completing and submitting the form below. If you are looking for a specif part number, please include it with your message.